Recurring emails are email messages that are supposed to be automatically sent, periodically, based on user defined settings. Although Outlook does not offer an easy way to send recurring emails, this article describes how to schedule recurring emails in Outlook (including Outlook 2013), with only a couple of clicks. 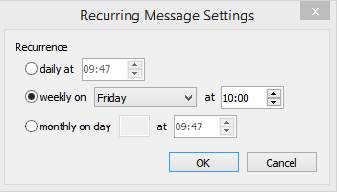 There is no function in Outlook especially designed to setup & schedule recurring emails. You may be able to fire recurring emails using Outlook tasks or macros, but the process is really too cumbersome to be detailed. The point of using recurring emails is to automatically resend the same message(s) to the same contact(s), saving you from manually resending the same email (or forgetting to resend it). To achieve this functionality, the only way is by using an Outlook add-in, such as Auto Follow Up for Outlook. 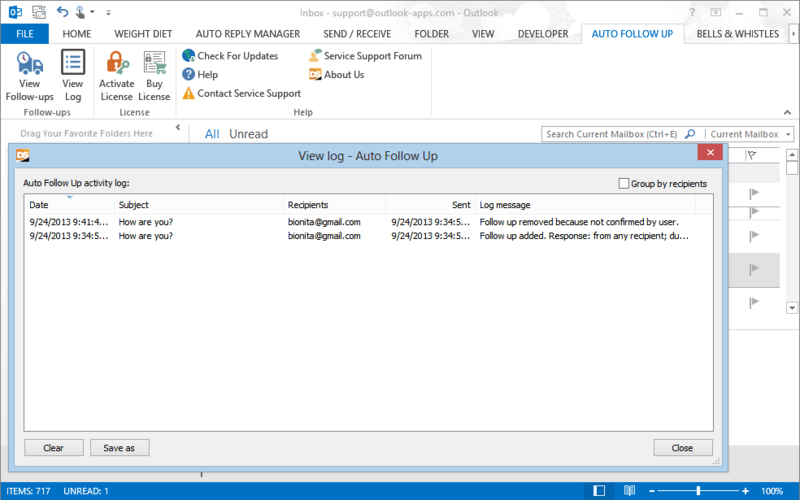 Auto Follow Up works with all Outlook versions, starting with Outlook 2003 and including Outlook 2016 (both x32 and x64 versions). Please note that recurring emails are only available starting with version 2 of Auto Follow Up, so please make sure you are using the latest product version. Even more, Auto Follow Up lets you automatically send follow-up emails to recurring emails, if your recipients didn’t reply to your scheduled email! For example, if your recurring email is supposed to remind your co-workers to send you a report, the program will automatically send reminders (follow-up emails) until your co-workers reply to your email. Starting with version 2 of Auto Follow Up, you can schedule recurring emails independent of previously sent emails. You can make recurring emails that are automatically sent every day or every week, at a predefined time. 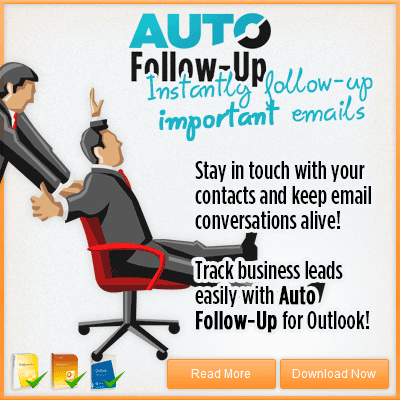 Click here to download Auto Follow Up for Outlook and start sending recurring emails! Auto Follow Up version 2 is here! Recuring emails are not only for spamming purposes. I need to set up a weekly reminder for my managers to have their reports ready for our weekly Thursday meeting. How can I do this? Hi we would like to schedule a series of follow up emails that will deploy based on whether or not the recipient has replied. once a user replies, this would stop the series. You can easily do that with our Auto Follow Up plugin for Outlook.